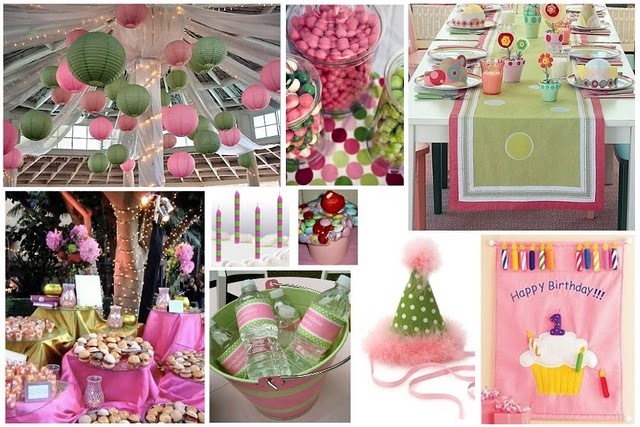 I'm stuck on the birthday party since Lallie's is coming up at the end of the month. 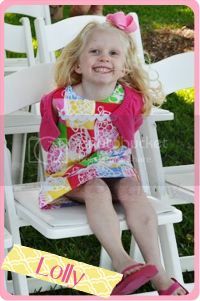 I can't believe this beautiful little two year old face (note her dress colors)....will be turning three already! Sorry for the poor picture quality, I had to scan and photoshop the picture since I didn't have a digital image. 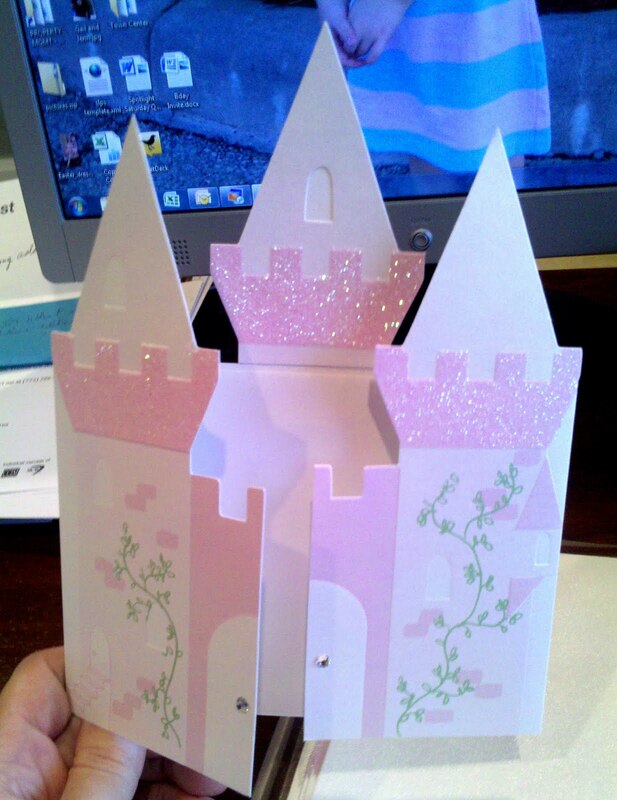 We are having a pink and green princess pool party and BBQ so I mailed out these adorable pink and green castle invitations to the little princes and princesses. The white parts are actually shimmering and so pretty. 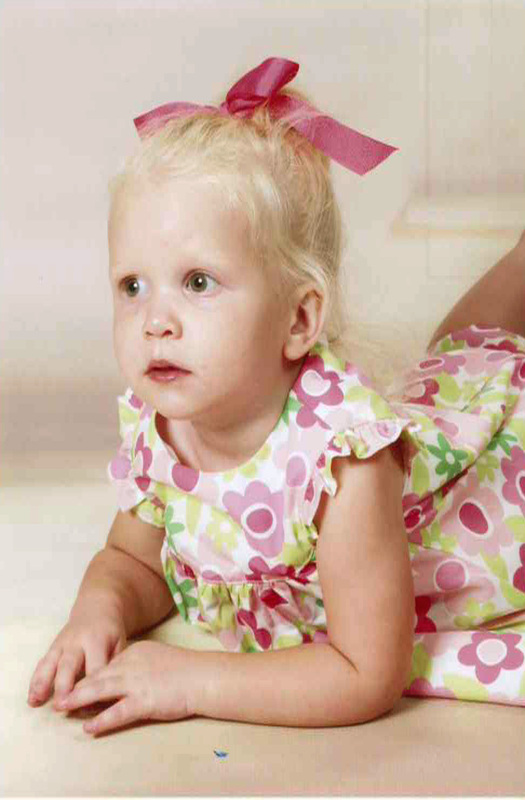 The poem inside the card reads "Princess Lallie (middle name) is turning three, She has invited you to her castle to celebrate with thee!" You can purchase them at http://www.merimeri.com/ and print them yourself, in pink and green lettering! Cupcakes - Thanks to my good friend who owns a cupcakery!!! 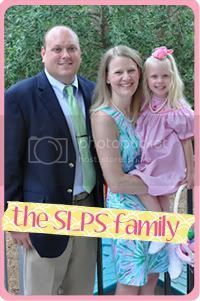 Can't wait to see them! Food - BBQ style dinner - we're eating Princess Bess Gets Dressed style by having dinner on the porch around the pool as princes and princesses need to play every once in a while too! 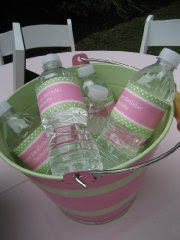 Water bottles - I am SO stealing the water bottle idea. Easy and costs nothing to do! Table - pink with a pink/green Lilly napkin runner (tape napkins together on backside to the length and width desired and then turn over). Pink and green plates and utensils (purchased at CVS!!!) Utensils will be wrapped like the picture below. Again, easy and inexpnsive! 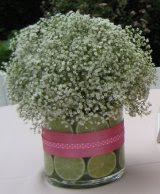 Centerpieces - mini flower pots decorated in pink/green ribbon with mini pink/green ribbon topiaries. The main food table will have the bowl filled with flowers (not baby's breath) with cut up limes. 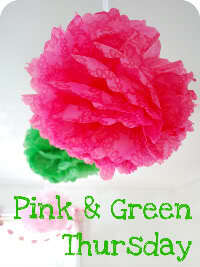 Decoration - pink and green pom poms made out of tissue paper - click HERE for tutorial and birthday banner. Party Favors - hmmmm....any thoughts on this? We have more boys than girls coming to the party and I really don't like cheesy (well I'll just come right out and say it).....crap.... that kids usually give out at birthday parties. I want it to be a little more classy. 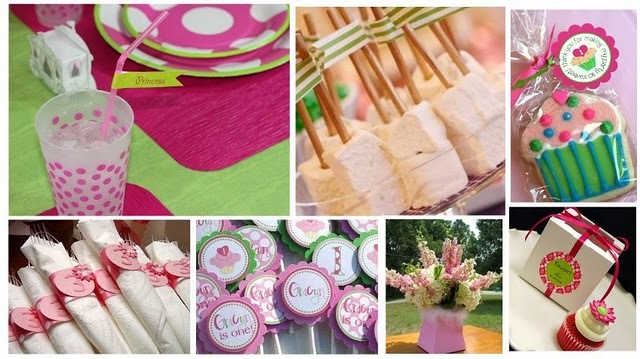 LOVE all that you have put together for her party -- it's going to be so special! 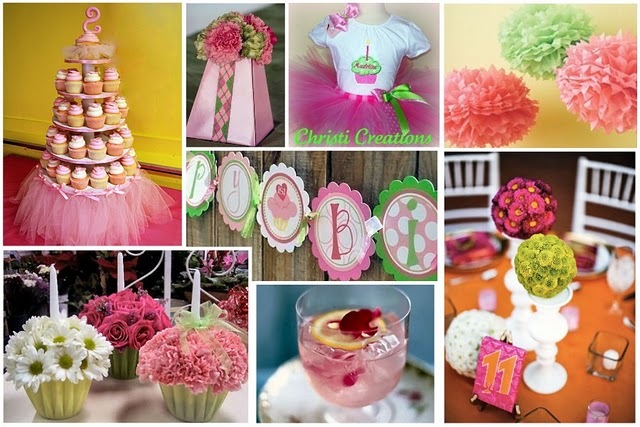 I am planning a pink and orange color-themed party for my daughter's first birthday in August and doing the water bottle thing and pom poms too. Best of luck with the final preparations for the party! I want you to plan my next birthday party. 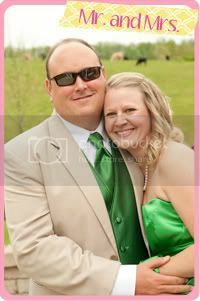 And maybe my wedding (if I ever get married). That's so pretty! I'm so sad I can't be there!!! That sounds like such a cute party! I love those invitations. That is going to be the most adorable party ever. I love the invitations with all the detail! Thank you so much for posting the tutorial!!! Question, on step 3, do you tie something around the middle before pulling piece by piece?? 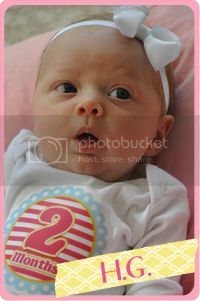 I so want to do poms for my bf's baby shower next month that I'm helping to host. If you get a jump on it, this is an idea I'm doing for my son's birthday. First, go to eBay and buy a lego minifigure mold. Then you can melt down different shade of pink and green grayons and make your own lego minifigure crayons. Or you can go to Lego.com and order specific green and pink Legos. Can I just tell you.....boys LOVE legos. Second idea. Pink beach towels and a bucket/pool toys for the girls and green beach towels and a bucket/pool toys for the boys. I know you don't like cheesy crap, but depending ob the ammount of kiddos coming, you can go broke buying nice beach towels, so you might want to consider going to a discount store for those. The other alternative is to just buy character pool towels from Target. This can get a bit ugly if someone doesn't like the character they got and wants what someone else got, so I would make all the boys towels the same and then all the girls towels the same. Just my two cents. Especially since they are going to be in the pool. Wow! You really go all out for birthday parties. I'm feeling like a great big flop now. How fun! The invitations are so cute! Can't wait to see what the final product looks like. Good luck! I am totally in love with the tutu tower! Friday Mix - Up Featuring CANDY!! !